When I think about the Sand Key Lighthouse the words perseverance, tragedy and strength come to mind. Located 9 miles south-southwest of Key West Harbor the Sand Key Lighthouse has witnessed numerous storms and tempests for over 180 years. 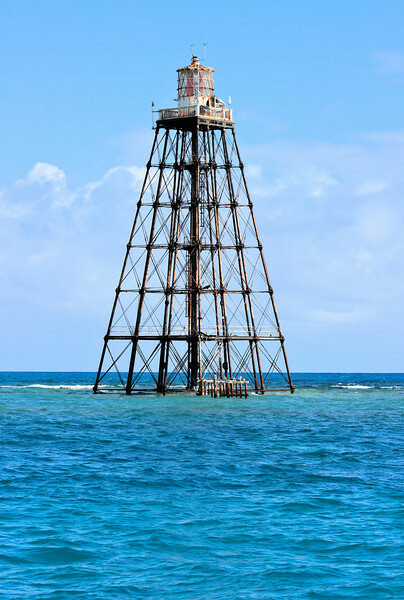 Two lighthouses have served the site as the guide to Key West through the dangerous Florida Reef. When the U.S. gained possession of the Florida Keys in 1821 the Lighthouse Establishment immediately set out to mark the islands with lighthouses. After constructing the initial lights at Cape Florida, Key West and the Dry Tortugas they turned their attention to building a light to guide commerce to the busy port of Key West. In 1826 Congress appropriated $16,000 to build a brick conical 65 foot tower upon Sand Key.